The Park, as operated by Harris County, consists of 12.5 acres of land around the Historic Frost Town Site and Buffalo Bayou. If one accounts for the future use of TX DOT property under the freeway system, this will add an additional twelve acres. In April 1985, Kirk Farris presented the park concept to the Houston Parks Board and to Harris County Commissioner El Franco Lee. Lee had Harris County help make the legal arrangements with area property owners to provide for public space. Through 1986 and 1987, Farris, Lee and Charles Tapley, the renowned architect, held several meetings to discuss expanding the park to include a hike and bike trail. From 1987 to 1992, Farris and AEA worked with Harris County Park crews, the Harris County Probation Department, and the Boy Scouts of America in clearing and mowing the land and removing garbage. From 1992 through 1994, Farris and AEA promoted the site to Mayor Bob Lanier, encouraging the City of Houston to adopt the bridge as a special project and to maintain the color scheme. The area was redistricted and became part of Precinct 2 under Harris County Commissioner Jim Fonteno. Fonteno purchased for the County a portion of the leased lands for an official county park property. 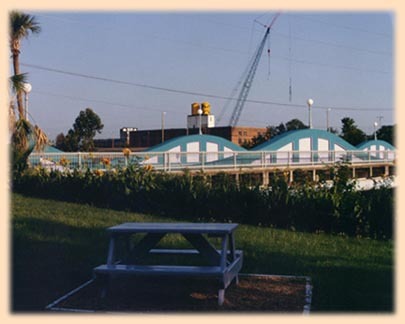 In 1994, we led a campaign to rename the McKee Street Bridge Habitat Park the James Bute Park. The Park was named after the late James "Jim" Bute IV who owned the Bute Paint Company, an original contributor to the McKee Street Bridge project. The name also refers to his grandfather, James Bute I, who was the founder of the Bute Paint Company, as well as a major contributor to the development of the city of Houston at the turn of the century. From 1994 to 1999, Farris and AEA continued to work to keep up the physical integrity of the area as a public green space. Keiji Asakura of Studio Land, Inc. created a master plan of the Second Ward area which included the James Bute Park as a Palm Garden, orchard and Urban Harvest garden, and featured the historic Frost Town site. Since July 2001 we have earned tax-exempt status for our real estate and we hope to raise additional funds for acquisition and improvements based on our master plan. Map of James Bute Park, with pending acquisitions.